A Myth Examined: Can Turkey Make You Tired? 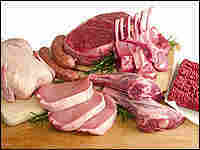 Though we often blame the turkey, nutritionists say virtually all meats, tofu, dairy products and nuts have tryptophan. The Thanksgiving Day snooze may have more to do with other things, like overeating, wine and dealing with social interactions. Sometimes the stories we tell ourselves have a way of becoming true. Take the turkey-makes-you-sleepy tale. A quick survey of holiday travelers commuting through Washington's Union Station confirms the hunch that a lot of people cling to this myth. "I think personal experience indicates, yes, it's true," says Catherine Newberry. Her friend Robyn MacAdams agrees. "Eating a lot of turkey does seem to make people tired," she says. But wait a second. Couldn't the Thanksgiving feast "gorge" factor explain the lethargy? This is Mary Ann Burke's theory. "Anytime you fill your plate four times," Burke says, with a laugh, "you're going to fall asleep." Burke is in town from Winter Park, Fla., visiting her sister for the holiday. Burke's too-many-calories theory is solid. Overeating makes you sluggish. When you add a little wine, the mood gets very mellow, very quickly. So why, if the explanation is so simple, does the story that tryptophan, an amino acid found in turkey, makes people tired persist? "I think it's based on a little correct information, but just misunderstood and misapplied," says Martha Stipanuk, a professor of molecular nutrition at Cornell University. Everything from turkey to tofu, and dairy products to nuts — as well as virtually all meats — contain about 20 amino acids. One of these amino acids is tryptophan. "There's nothing unique about turkey and its tryptophan content," says Stipanuk. It contains about as much as other meats. So, if there were a direct sleepy effect, we'd feel it with all protein. Once tryptophan enters the body, it becomes the building block — or precursor molecule — of serotonin and melatonin. These are two brain compounds involved in regulating mood and sleep. In laboratory studies, when scientists intentionally manipulate people's tryptophan levels by having them drink a specially formulated amino acid drink, they examine how tryptophan can alter sleep — and, perhaps, levels of cooperation, too. In one study, the University of Oxford documented what happens when players engage in games of prisoner's dilemma. During the game, players can either compete with their opponent to try to win everything; or, they can cooperate and divide the reward. It turned out that tryptophan-deprived players were significantly less likely to cooperate. "I was surprised by the magnitude of the effect," says Robert Rogers, of Oxford's Department of Psychiatry. When people take tryptophan supplements, the purified compound can get to the brain with relative ease. But after a turkey feast, the tryptophan molecules are slowed down. They're, in essence, delivered to the body as part of a package with lots of competing amino acids. "If you feed people a high protein diet, you don't get changes in brain tryptophan or serotonin," explains Stipanuk. The reason? A traffic jam in crossing the blood-brain barrier. After a meal, all of the amino acids contained in protein-rich food are competing to get from the bloodstream to the brain. Think of it as a revolving door. "If you're a tryptophan molecule, you want to get through that door," says Simon Young of McGill University in Montreal. But with lots of other amino acids competing, it takes you longer to get in. Having heard the evidence, Robyn MacAdams, traveling through Union Station, has a different theory about one possible cause of the post-Thanksgiving feast letdown. "Maybe it's because I'm around my family, so I just want to sleep," MacAdams says jokingly. And social interactions around the holiday may trump specific chemical changes brought on by food. "Here we are thinking that some substance is going to alter our destinies," says Christine DuBois of Johns Hopkins University. Instead, we need to realize that the way we treat people and interact with people is so paramount."